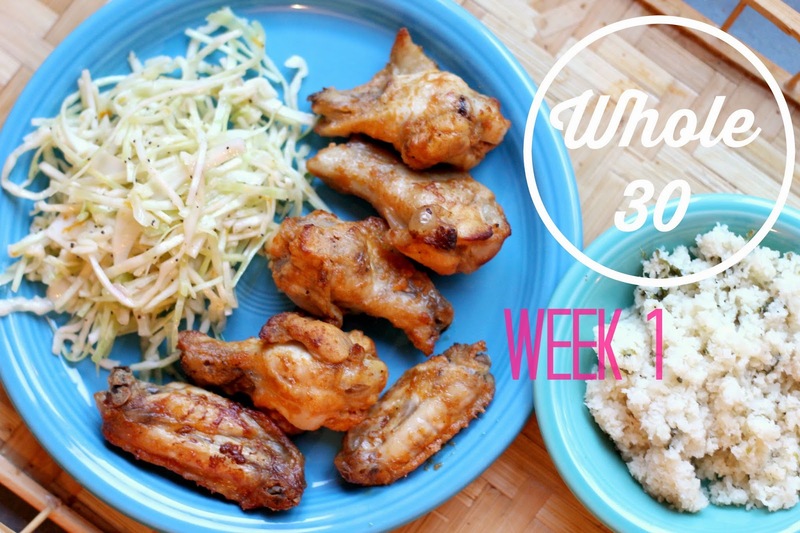 For the month of September, I'm going to attempt to complete the Whole 30 challenge. I've heard a lot about the Whole 30 Challenge in the last year or so, but never thought it would be something I'd be interested in. No alcohol for 30 days? No way Jose. Last week after reading this post about Jennifer's Whole 30 experience and results, I was jazzed to try it for myself. When T and I moved to Greenville almost 4 years ago, I weighed 10 pounds less than I do now. Luckily I can still fit in to the majority of my clothes, but I don't feel as confident as I once did in them. I also just don't feel as good as I used to. I went from eating well and exercising 4-5 days a week to drinking 4-5 days a week and not exercising at all. It's a miracle I haven't gained more than 10 pounds. While the purpose of this challenge is not to lose weight, it definitely is a tangible benefit. As I've gotten older, I've developed food allergies and intolerances to different kinds of foods, mainly legumes and dairy. I'm really excited to see how I feel after cutting these foods completely out of my diet. If I do successfully complete this challenge, this will also be the first time since I was 18 that I've gone 30 days without alcohol. If you're reading this, sorry Mom. The problem I've had in the past with diets is that the food just doesn't taste good. I LOVE food, and put so much thought and preparation into every meal. I mean who really wants to snack on a rice cake? Yuck. The one thing that was so inspiring about Whole30 is that I get to eat real foods with, get this, real fats. I've had fun pinning a lot of the Whole 30 recipes, but I've actually been able to use a lot of the recipes that I've been cooking for years. I'm now 3 days in to my first week, and things are going great! The toughest challenge for me so far is the lack of sugar. There are no added sugars allowed, so the only way I can get my sugars are from fruits. I've had to time when I eat fruits during the day, so that I don't get a headache mid-afternoon. I found that a small serving of fruit or fresh squeezed juice in the morning with another piece of fruit in the afternoon works for my body. I think the next tough challenge coming up will be the alcohol. This week hasn't been bad at all, but pouring a glass of wine at 5:00 on Friday is usually one of the highlights of my week. I plan to substitute the wine with San Pellegrino and a lime wedge in a wine glass. Obviously it's no Sauvignon Blanc, but it's better than nothing! One thing that I've done that has made this first week a little easier is planning out every meal ahead of time. I spent the majority of Monday prepping all of my meals, so that I had no option to cheat due to lack of time. I was also worried about the cost of this. We are on a very strict budget and allot ourselves $80 a week for groceries. I usually use every bit of that at a normal grocery store, so I figured I'd go over buying all organic produce and grass fed meats. I bought everything that I could at Trader Joes, and then purchased the remaining items (including all of my meat) from Whole Foods, and spent $81 and some change. Here is my meal plan for this week. I've provided links for the recipes that I got from Pinterest, but a lot of them were things that I already make or foods that require no recipe. D- My first attempt at eating out, eek! Wish me luck. Hey Laura! I did W30 back in January and am so glad I did. I got so many compliments on how my skin was glowing, I slept much better, and overall just felt great about myself. I have also developed food allergies over the years and its amazing how better your body feels once you eliminate those toxins. My doctor recommends doing W30 4x a year to "reboot" your system. The alcohol part was torture, but you'll be glad you did it in the end. Good luck!! So glad you posted about this, especially your meal plans. Hoping I can convince Cameron to do it with me, as I'm sure it's a lot easier if your partner does it, too! I want to chat with you about this!!! My beach body coach and I are talking about doing it and I want to order the book to read up on it before I start! Going to email you! I definitely want to try this, but one of the hardest things for me is not being at home every night to cook. Since I have to work sometimes until 11 p.m. I'm not able to go home to eat and have to eat out somewhere, and it usually ends up being fast food. I don't really drink so that part wouldn't be an issue but I LOVE chocolate. I'm really interested in doing it, but I'm definitely going to need to do more research first!